Well anyway, we know that adjustable LCA:s are costly, eg OEM GT3-arms. Those are supposed to be rebranded SPC-units. However I read that some eg. Steved0x had some issues with something coming loose (Did not really understand what part.) Also if I understood it correctly there are some revised versions where this should have been adressed. Does anyone have the latest news on this? Can I see on the pictures if the part is revised or not? We should really have some consensus on the adjustable LCA-thing.. We all want them..
Stock arms have shims to install and are bolted end to end. Little to no chance that it will slip or adjust on it's own. These have slotted holes, and I would not trust that under track loading. If they would slip under load you could have a serious handling issue. This threaded cap is what comes loose on the old design, this is a photo is of the revised part, the threaded boss and bolt retains the cap. I would have no hesitation to run this new design. 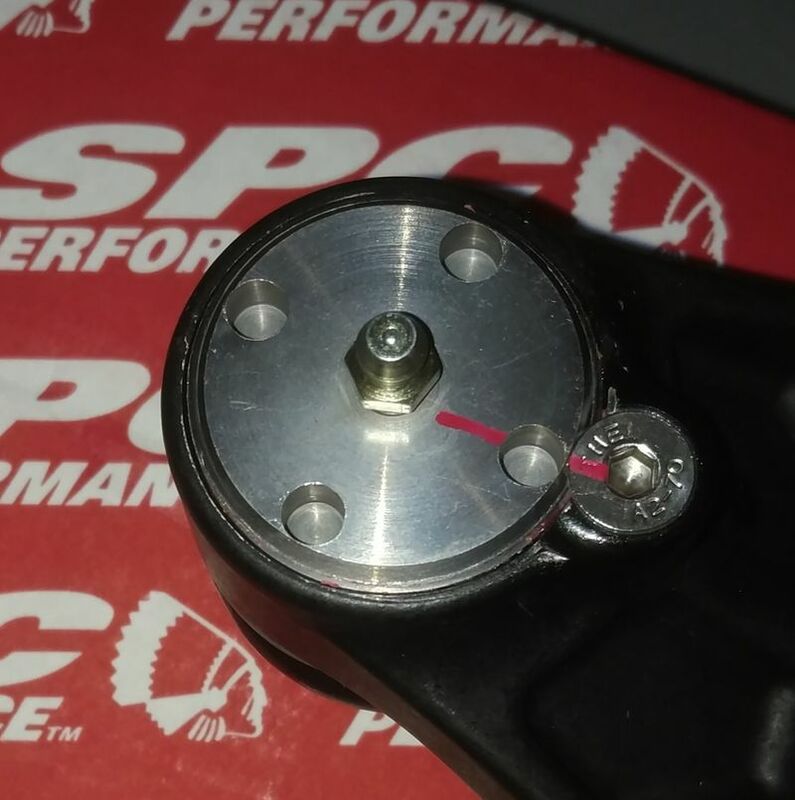 I'll have to check my sheets, i think i ran those arms on maybe 15-20 track days and while i had trouble with the cap unthreading, i never had any trouble with the adjustment part (the big bolt that you turn to extend/retract the inner end and the 4 bolts that lock down the big bolt). I ended up ordering the GT3-arms from FVD, looks like I´ll get them tomorrow so then I know if they really are OEM brand or not. 2) I see advices regarding swapping the thrust arm bushing to solid, I cannot really understand why that would be super important, but hey.. What parts can we find? 3) My car is a daily driver but I want to keep it very track focused anyway, what camber do I dare aim for. Now I have approx -0.9 and that is obviously far too little, so I´m thinking 2-2.5 might be reasonable to try. Any thoughts? 4) Given the camber setting according to bullet 3 above, what camber might be reasonable on the rear? Would I reach it with oem specs or do I need adjustable LCA:s in the rear too? Tires are Cup-2 but next summer the plan is Trofeo R.
Last edited by Robert986; 12-27-2018 at 05:13 AM. If you are getting GT3 style LCA then instead of retrofitting a cartridge, you can just gt a whole new end. It seems the adress in my link gets "censored" by default, why is this? Last edited by Robert986; 12-28-2018 at 05:05 AM. I see.. ok hope I don´t break any forum rule if I spell it out.. It´s C A R I D .com They also have the Torque Solution Thrust Arm Bushing kit for 215USD, I might look into that. So.... ? How 'bout it? Do we have a consensus yet, on which LCA's make the most sense, and offer the best value? Those are the ones I ordered and they are actually complete with shims AND the inner part! OEM-part that looks great! I don´t see how you can beat that price. Have searched but not really found.. I plan to still DD my car but want it as trackable as possible, comfort is not my thing. Does it make sense with 2,5-ish Neg camber in the front then? And the big question: What about the rear, would it then make sense with approx -2degrees in the rear, and can that be dialed in without adjustable LCA:s? Need to know if I should order adjustable or regular in the rear..
By "factory" you mean OEM 986 LCA's? Wow, I hadn't looked at those FVD adjustable LCAs. How much was tax and shipping on those? How many shims and what thickness? Last edited by JayG; 12-30-2018 at 04:43 PM. 256EUR is including tax it was approx 30EUR in shipping to me in Sweden. Does FVD ship to the USA? Google fvd, instead of following the link. You'll find the us site. OK they are in Pompano Beach, FL. These controls arms are $316 each, shipped out of Germany. I'm debating: Elephant Quick Change camber plates or these... What is the benefit of these LCAs over the elephant camber plates that provide 2 deg extra camber?